when they are, apparently Time & Motion consultants called in to improve Dimkins' working efficiency. Failing to come up with anything worth reporting, they abandon the job and return to "what they know best" - which is window cleaning. Three weeks later they are back in the guise of accountants harassing Atkins of Accounts and blissfully adding in the date at the top of the ledger columns to the totals. Back to window cleaning again. Whilst continuing to clean the windows of the Chester-Perry Building, young Godfrey is fretting for a change from the leathers and the ladders. His more experienced father (only known to us as "N") puts him in his place. Pointing through the window to Bristow he tells his son "There’s always someone worse off than you". Fortune smiles on N Walters & Son, Signwriters when the local council needs to fill the park with signs ("Keep off the grass", "No games" etc etc). Whenever Bristow needs a specialist service, somehow it is always N Walters & Son who turn out to be running it. 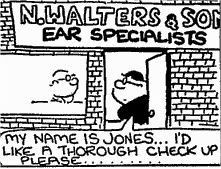 On the occasion that Bristow promises to do Jones’ work for him and Jones rushes out to get his hearing checked, it is of course N Walters & Son, Ear Specialists who are on hand. And when Mr .Gordon Blue derives his secret formula for hamburgers. who should be listening but N Walters (& Son) who then go into business as "Hamburgers for the hungry".